Plot raw IMU readings on top of video. As an optional hardware upgrade, one can install a global shutter sensor into JeVois (an OnSemi AR0135 1.2MP), which also includes on its custom circuit board for JeVois an inertial measurement unit (IMU). The IMU is a 9-degrees-of-freedom (9DOF) TDK InvenSense ICM-20948 (with 3-axis accelerometer, 3-axis gyroscope, and 3-axis magnetometer). This IMU also includes a digital motion processing unit (small programmable processor inside the IMU chip), which allows it to compute and filter Euler angles or quaternions directly inside the IMU chip. This module only works with optional JeVois sensors that include an IMU! The base JeVois-A33 smart camera does not have an onboard IMU. This module demonstrates the RAW and FIFO modes of the IMU. 3-axis 16-bit accelerometer with full-range sensitivity selectable to +/-2g, +/-4g, +/-8g, and +/-16g. Accelerometer data rate from 4 Hz to 1125 Hz. 3-axis 16-bit gyroscope with full-range sensitivity selectable to +/-250dps (degrees/s), +/-500dps, +/-1000dps, and +/-2000dps. Gyroscope data rate from 4 Hz to 1125 Hz. 3-axis 16-bit magnetometer (compass) with wide range of +/-4900uT (micro Tesla). Magnetometer data rates 10 Hz, 20 Hz, 50 Hz, or 100 Hz. 16-bit temperature sensor with readout rate of up to 8 kHz. RAW data mode (get current sensor values at any time), buffered (FIFO) data mode (sensor values accumulate into a FIFO at a fixed rate), and digital motion processing mode (DMP; raw data is processed on-chip). basic activity recognition: drive, walk, run, bike, tilt, still. With quaternions computed on-chip, with an algorithm that gets sensor data at a highly accurate, fixed rate, and applies various calibrations, drift corrections, and compensations on the fly, one gets highly accurate real-time estimate of the sensor's pose in the 3D world and of how it is moving. Note that communication with the IMU is over a 400kHz I2C bus, which may limit data readout rate depending on which data is requested from the IMU. RAW: One can access the latest raw sensor data at any time using the getRaw() or get() functions. This is the simplest mode of operation. One disadvantage is that if you are not calling get() at a perfectly regular interval, there will be some time jitter in your readouts. The IMU does not provide any time stamps for its data. FIFO: In this mode, data from the sensor is piled up into a 1 kbyte FIFO buffer at a precise, constant rate (when all three of accelerometer, gyroscope, and magnetometer are on, the gyro rate determines the FIFO buffering rate). Main advantage is that you can then read out the data without having to worry about calling getRaw() or get() at a highly precise interval. But you need to be careful that the FIFO can fill up and overflow very quickly when using high sensor data rates. DMP: In this mode, data is captured from the sensor at an accurate, fixed rate, and is fed to the on-chip digital motion processor (DMP). The DMP then computes quaternions, activity recognition, etc and pushes data packets into the FIFO as results from these algorithms become available. Definition at line 64 of file DemoIMU.C. Definition at line 68 of file DemoIMU.C. Definition at line 74 of file DemoIMU.C. Definition at line 115 of file DemoIMU.C. Definition at line 121 of file DemoIMU.C. Definition at line 77 of file DemoIMU.C. 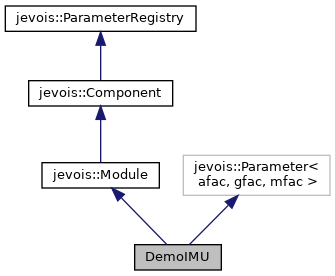 References jevois::IMUdata::ax(), jevois::IMUdata::ay(), jevois::IMUdata::az(), jevois::RawImage::buf, jevois::rawimage::drawFilledRect(), jevois::rawimage::drawLine(), jevois::RawImage::fmt, jevois::IMUdata::gx(), jevois::IMUdata::gy(), jevois::IMUdata::gz(), jevois::RawImage::height, JEVOIS_REGISTER_MODULE(), jevois::IMUdata::magovf, jevois::IMUdata::mx(), jevois::IMUdata::my(), jevois::IMUdata::mz(), jevois::RawImage::pixels(), jevois::RawImage::pixelsw(), jevois::RawImage::require(), jevois::sformat(), jevois::IMUdata::temp(), jevois::RawImage::width, and jevois::rawimage::writeText(). Definition at line 124 of file DemoIMU.C.